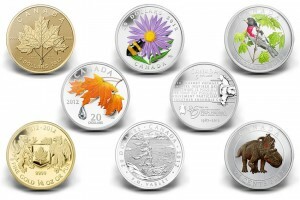 As it continues to advance the art and science of coin manufacturing, the Royal Canadian Mint is proud to introduce a striking variety of new collector coins which celebrate Canada through nature, art and history. In a year of historic anniversaries, the Royal Canadian Mint is pleased to release exquisite new collector coins which add to the ongoing celebration of the Diamond Jubilee of Queen Elizabeth II. New coins from the Mint also respectfully remember the sinking of RMS Titanic, a historic tragedy which occurred near Canada’s shores 100 years ago. 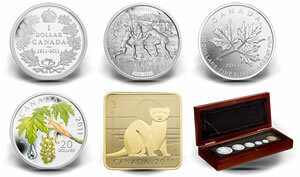 The Royal Canadian Mint is pleased to introduce exciting new gold, silver and base metal keepsakes inspired by Canada’s historical, cultural and artistic heritage by launching its first collector coins of 2012. Leading this impressive array are the 2012 Proof and Brilliant Silver Dollars, as well as two new Proof Sets, which pay an unforgettable tribute to the 200th anniversary of the War of 1812. The Royal Canadian Mint is proud to announce it has crafted the world’s first 10-kilo 99.999% pure gold coin and that this exquisite numismatic creation has been dedicated to Bill Reid’s The Spirit of Haida Gwaii; one of the most celebrated masterpieces of Canadian art. Did you know that the Royal Canadian Mint’s high-tech plant in Winnipeg produces over 1 billion circulation coins every year? That’s like 20 million coins per day or 750 coins per second. The Royal Canadian Mintis pleased to cap off the celebration of Parks Canada’s centennial year by unveiling five new commemorative circulation coins which immortalize Canadians’ pride in their legendary natural heritage and capture their trademark passion for the great outdoors. 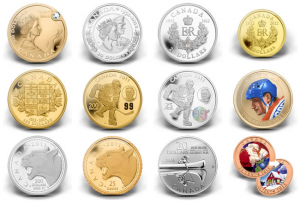 As Her Majesty Queen Elizabeth II prepares to celebrate an unprecedented 60 years as Canada’s monarch and after "The Great One" reached a new milestone by turning 50 in 2011, the Royal Canadian Mint is excited to release an array of collector coins based on these and other distinctly Canadian themes. The countdown to Her Majesty’s Diamond Jubilee is being marked by several 2012-dated coins: a $300 face value 99.999% pure gold featuring the world’s first genuine diamond insert; a 99.99% pure 1/10 ounce gold coin and a $20 fine silver coin featuring the Royal Cypher; and a $20 fine silver coin featuring the profiles of Queen Elizabeth II and HRH Prince Philip. 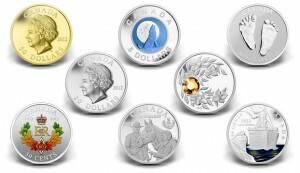 The Royal Canadian Mint is heralding the return of spring with a parade of coins showcasing Canada’s unique ties to royalty and its profound attachment to its natural and cultural heritage.